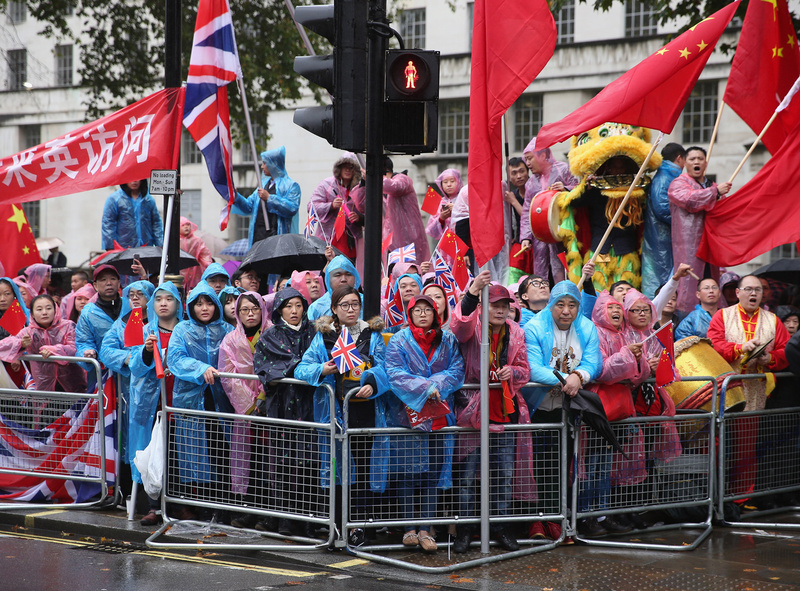 Protesters and supporters await the arrival of President Xi Jinping at Downing Street in London, England, October 21, 2015. As British Prime Minister Theresa May arrives in Beijing today, where is the U.K.’s relationship with China heading? Despite a complex history, U.K.-China relations have remained a relative bright spot in China’s engagement with the West in recent years. Before Brexit seemed like a genuine possibility, the U.K. government envisaged a “golden era” of engagement with China as a way to stimulate Britain’s economy and diversify international linkages. With the reality of Brexit now looming, many British policy elites see boosting ties with China—on track to become the world’s largest economy—as an urgent task, notwithstanding Theresa May’s reported hesitancy to endorse China’s Belt and Road Initiative. While most media attention has been focused on negotiations with Brussels, the U.K. government has taken steps to revive the golden era agenda. Late last year while visiting Beijing, British Chancellor Philip Hammond unveiled a U.S.$1 billion U.K.-China investment fund focused on enhancing Asia-Europe infrastructure links. Former Prime Minister and key golden era architect David Cameron was tapped to help lead the new fund. Meanwhile, Britain is pursuing new opportunities for engagement with China under the U.K.’s China Prosperity Fund and other frameworks. The U.K. government seeks to resolve market access barriers and improve regulatory cooperation with China to foster more trade and investment in sectors where Britain enjoys global competitiveness. British leaders hope progress on these fronts can help the U.K. and China build “a global comprehensive strategic partnership” that can deliver benefits for years to come. However admirable, these efforts to unlock closer cooperation with China entail a large leap of faith. In a Brexit context where a solitary U.K. has limited bargaining leverage vis-à-vis China, deeper engagement is based on the assessment that China’s developmental trajectory and future goals are compatible with Britain’s. More specifically, current optimism about U.K.-China cooperation seems to hinge on three key premises. The first assumption is that China is actively committed to building an open, rules-based economy. The second premise is that, despite China’s Leninist governance structure, pockets of liberal practice and regulatory consistency will persist and continue to grow. The third premise is that, in dealing with China, Britain can keep separate the economic and political realms, enabling deals to be done when economic interests converge, even if deeper values do not align. But contemporary political and policy trends in China call each of these premises into question. There is much evidence to suggest China is doubling down on a statist model of economic regulation rather than reducing government intervention in the economy. Meanwhile, the Communist Party’s tightening grip over organizations and individuals raises questions about the ability of foreign actors to operate successfully in China. These trends, along with China’s outward projection of political influence, bode badly for hopes of keeping the economic content of U.K.-China relations separate from political challenges. 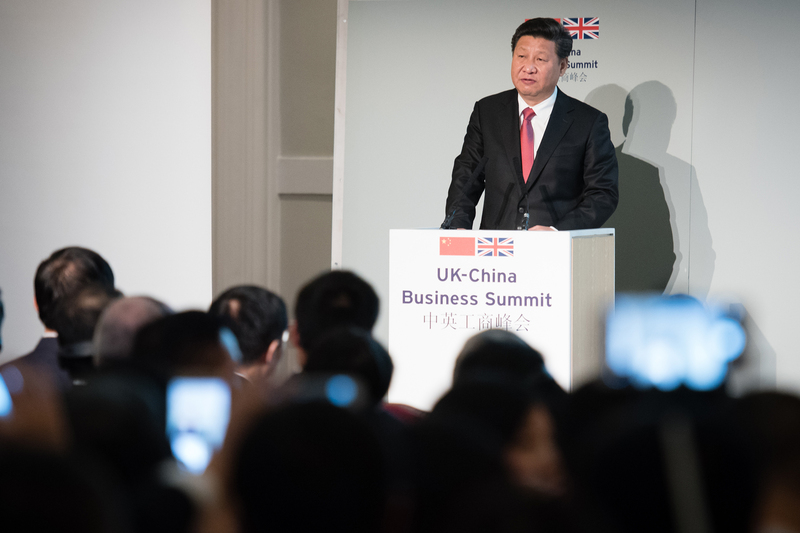 Many in Britain’s business and political circles believe China is committed to the program of economic liberalization envisioned in the Third Plenum Communiqué of the 18th Chinese Communist Party Congress in November 2013. Since that time, rhetoric of economic globalism and promises to further open China’s markets to foreign enterprises have featured in Xi’s report to the 19th Party Congress in October 2017 and Xi’s comments over the past year to Western business leaders. The China-Britain Business Council expresses hopes that China’s continued opening-up “will bring opportunities for British businesses in finance, insurance, design, marketing, accounting and auditing,” and argues that now is “the time when UK businesses have their greatest competitive advantage in China.” Sharing this sunny outlook, U.K. officials cite British capabilities in advanced manufacturing and aerospace technology that overlap with Chinese ambitions to develop these sectors. The allure of the Chinese market is particularly great as Britain seeks to offset the impact of leaving the European Union. Notwithstanding China’s win-win economic rhetoric and calls for enhancing international trade and investment links, however, Beijng’s commitment to deeper economic liberalization is uncertain. Despite headway in some areas in the three years since the bold reform pledges of the 18th Party Congress Third Plenum, China has made only limited progress on market-oriented reforms in the state-owned enterprise sector, fiscal realm, investment realm, and competition policy realm. The reforms that have gone furthest in recent years have relied more on political levers than regulatory institutions, and have tightened rather than loosened central control over society and the state. On the economic side, Xi’s leadership has pushed “supply-side structural reforms” to consolidate industrial sectors with excess capacity, and has deployed strong administrative tools in the financial sector to maintain market stability and restrict unwanted capital flows. On the environmental front, the Xi leadership has imposed “blunt force” pollution controls. Meanwhile, China has carried out sweeping institutional overhauls of the Party discipline apparatus and the military command structure. Similar statist logic is apparent in the key policy initiatives guiding China’s international economic engagement. The Belt and Road Initiative, the flagship economic development strategy of the Xi era, seeks to promote economic linkages and position China more centrally in the global economy through the coordinated development of new infrastructure and new interstate cooperation modes. As official documents emphasize, it is an initiative undertaken with “high-level guidance and promotion” and based on mega-project development and concerted policy support. Along similar lines, the Made in China 2025 industrial upgrading strategy calls for expanded outbound investment in technology industries, but it does so for the purpose of enhancing China’s own market dominance in “smart manufacturing” sectors. Such policy initiatives may hold near-term opportunities for China’s economic partners, but they are guided more by a neo-mercantilist mindset than by commercial considerations. Guests and delegates take photos and videos as President Xi Jinping delivers a speech at the U.K.-China Business Summit in Mansion House in London, England, October 21, 2015. The U.K.’s pursuit of new cooperation opportunities also assumes that China’s domestic governance system will provide the institutional guarantees foreign organizations need to thrive. The British government’s interest in new bilateral investment and trade agreements shows a sense of optimism that China will adhere to legal principles that are clear and fairly applied, and that, even if China’s political institutions diverge from those in the West, China will preserve and expand pockets of liberal practice in the economy. The U.K. government has long stressed the importance of commercial rule-of-law norms. While the Foreign and Commonwealth Office (FCO) highlights practices such as uneven application of anti-monopoly law as challenges for foreign firms operating in China, efforts to boost bilateral investment flows reflect confidence that China’s legal institutions are improving. Over the past two decades, China has built a relatively robust commercial rule of law regime even in a context where the Party remains final arbiter. Given China’s growing ranks of legal professionals and ongoing efforts to restructure the judicial system, technical hurdles to a credible commercial rule of law do not seem insurmountable. If improvement to China’s commercial rule of law is one basis for U.K.-China engagement, China’s system of territorially differentiated regulation (embodied in its special zones) is another. The ingenuity of China’s reform-era governance has consisted in the combination of a unified political structure with pockets of flexible policymaking. The “segmented deregulation” enabled by special zones of different types—from the original special economic zones of Guangdong and Fujian to comprehensive reform pilot zones in cities like Changsha and Wuhan—has catalyzed economic growth and experimentation. In recent years, China has continued to use the special zone model, authorizing several Pudong-style New Areas and a set of free-trade zones. The U.K. government’s interest in the economic potential of special zones is apparent in a recent call for proposals on how the U.K. and China might apply the development zone concept to new hubs of U.K.-China economic cooperation where knowledge-oriented businesses can thrive. There is little question that foreign businesses will continue to find growth opportunities in China. Post-reform China has succeeded beyond anyone’s expectations at embedding economic dynamism in the power structure of the Party-state. If China’s leaders sought to contain market activity within the “birdcage” of planning in the early years of reform, the governance model of recent decades has been more like a fishing trawl. While never letting go of the netting, the Party-state has allowed wide openings in the economy and in society. The trouble with fishing nets, however, is that they can be hauled in. As Xi Jinping has consolidated power since 2012, the lines of political control in China have tightened, and many economic, social, and cultural spaces that were once loosely policed are now closing. Xi is an avowed Leninist, and his stern leadership style has suffused the Party apparatus as a whole. Once-slack links between the Party and enterprises, educational institutions, and other organizations have been reinvigorated. Recent moves by the Party to re-assert authority and enhance discipline are not at all certain to offer advantages to foreign firms or to the private sector more broadly. The activation of Party cells in foreign businesses and academic ventures that operate in China have sent shivers through the expatriate community. In addition to the pressure they have long faced to transfer technology and managerial expertise, foreign firms operating in China have been warned to comply with China’s censorship policies and keep company data on China-based servers. The domestic private sector, too, is facing tighter Party oversight and guidance. In 2017, the central government announced its intention to take equity stakes in leading technology sector firms, positioning Beijing to exert control from within as well as without. The clearest manifestations of intensified Party-state control have been in the political realm. The aggressive and far-reaching anti-corruption campaign Xi Jinping launched in 2013 has enjoyed some level of public support, but it has often been conducted by harsh, extra-legal means. Observers hoped that Xi’s calls for strengthened Party and state supervision institutions might bring more legal clarity and checks and balances to the anti-corruption struggle, but the recently released draft supervision law suggests that Party-style discipline practices may be applied to an even broader swath of public employees. Members of the public have also faced an escalation of political and ideological control in recent years. Online and academic spaces of discussion have narrowed. The Party-state has stepped up pressure on perceived troublemakers in society, from political activists, human rights lawyers, and public intellectuals to unauthorized capital-city residents. Beijing has adopted a harder line toward unsanctioned religious organizations, and has mounted a heavy-handed response to perceived security threats from Xinjiang’s Uyghur ethnic minority. Some aspects of this tightening are cyclical, linked with Xi Jinping’s consolidation of power. But other aspects are more institutionalized, and could feed a repressive atmosphere for years to come. If these trends were confined within China’s borders, their effect on U.K.-China economic engagement might be indirect. But these trends are increasingly spilling over into China’s foreign relations, creating new, qualitatively different challenges. Underpinning the initial U.K.-China “golden era” rhetoric was an assumption that the U.K. could finesse the political difficulties in its relationship with China, allowing economic ties to develop unencumbered. In crafting a new relationship with the Chinese after leaving the EU, the U.K.’s ability to overcome political sticking points in its relationship with China will grow even more critical. Not only is the number of potential issues growing, but soon the U.K. will have to repatriate from Brussels a number of delicate and sensitive topics that have long been outsourced to the European level. International policy around human rights, issues such as the arms embargo, and decisions over the design of the U.K.’s trade defense instruments will soon be the direct responsibility of the U.K. government. There is a perception among some commercial commentators and political actors that frictions in the U.K.-China relationship can be avoided. These actors argue that the vital importance accorded by the Chinese to economic development has implied a separation of the economic realm from the political one: so long as sensitive topics are avoided in bilateral talks or downplayed in the public domain of engagement, economic benefits will follow. This may have been a reasonable premise upon which to base U.K. strategy toward China in previous years, but it is no longer clear that economic issues can be delineated from politics. The changing tenor of China’s domestic politics, along with the perception that China is projecting influence in other countries’ affairs, has already generated a backlash in several Western nations. A spate of recent news reports suggesting the influence of Chinese interests over politicians in Europe, New Zealand, and Australia have fueled concerns that liberal democratic institutions around the world are being subverted by authoritarian regimes. There is similar anxiety in settings like Australia and the United States about perceived Chinese influence into the higher education sector, whether in the form of direct coercion of academics like Australian scholar Feng Chongyi, organizational control via the proliferation of Confucius Institutes, or more subtle influence from large-scale Chinese donors. While such trends have already shifted public debates in key U.K. allies like Australia, New Zealand, and the United States, Britain has been behind the curve of anxiety. Whether a function of the U.K.’s preoccupation with Brexit, lingering golden era optimism, or the fact that the U.K. is less directly involved in Pacific Rim geopolitics than its allies, policy elites in the U.K. have not voiced the same degree of concern as their counterparts abroad. In the near term, this creates a possibility of dissonance between the U.K.’s approach to China on the political track and that of its allies, which could be compounded if the U.K. also outlines a more accommodating policy on trade and economic issues. In the medium to long term, however, it is possible that the public debate in the U.K. will converge with the discussions now taking place in Australia and the U.S. If the public mood toward China sours, active efforts by the U.K. government to deepen U.K.-China economic ties have the potential not only to complicate diplomacy with key international allies but also to generate domestic political blowback. The U.K. and China have built a broadly positive relationship, and there are strong drivers for continued cooperation. The two countries are, and are likely to remain, significant trade and investment partners. The U.K. plays a key role as a commercial and financial interface between the West and China, and a pivot for cultural, education, and scientific exchange. These ties have been mutually advantageous and are worth preserving. In a post-Brexit context where the U.K. will have less bargaining leverage vis-à-vis China than it enjoyed in the past, however, the conditions for future engagement are different. If the trends discussed above continue, simply maintaining a healthy U.K.-China relationship, let alone deepening it, could prove a challenge. And unless closer economic alignment with China is based on an unvarnished picture of China’s domestic environment and international strategy, it may lead to unintended concessions and costs on Britain’s part. Continuing backlash against plans for a Chinese firm to help construct a nuclear reactor at the U.K.’s Hinkley Point C power station highlights some of the commercial and political risks both sides face as cooperation extends to larger projects and more contentious realms. Meanwhile, Theresa May’s reported plans to raise concerns about the governance of the Belt and Road Initiative during her China trip speak to a growing awareness that the U.K. could undercut relations with traditional allies by aligning itself too closely with China’s global ambitions. The U.K.’s main economic challenge outside the EU will be to manage an emerging power asymmetry with leading world economies—the United States, the EU27, China, and India. When it comes to bilateral ties with China, overlapping interests in sectors in which Britain currently retains global competitive advantage show that opportunities do exist and could be modeled into a credible engagement strategy. However, the bedrock of any such a strategy is a sober assessment of China’s economic and political trajectory. The current optimism among Britain’s political elite about crafting a strategic economic partnership with China appears to be based on a misapprehension of China’s direction of travel. Unlocking market access reciprocity and trade fairness continues to elude both the U.S. and the EU as each develops its bilateral relations with China. There is scant evidence to suggest that a solitary U.K. will do any better.